It's easy to get excited about pie and my husband is visually animated when he knows that I will be making homemade pie from scratch. This is not a sweet pie, however, but something even better in my opinion, and that is a savory pie with a spicy and hearty samosa filling complete with plump chickpeas and a rich butter crust. It is a dinner pie. I was fortunate to have access to local produce, making this unique fusion-style Indian dish an extra special flavorful centerpiece for the dinner table. Think of it as a samosa on steroids. Inventive uses of pastry, in particular pies, appear to be all the rage currently. I've noticed quite a few new publications featuring pies, mini ones and full sized ones, both savory and sweet, vying for the attention of home cooks and chefs alike. This one comes shortly after the aloo palak paneer pie with a potato crust that I served up recently as part of a ritual weekend meal that we usually enjoy with our best friend Basil. I can assure you no one left the table hungry, especially as I served it up with some pappadums with an avocado salsa, grain and side leafy green salad. 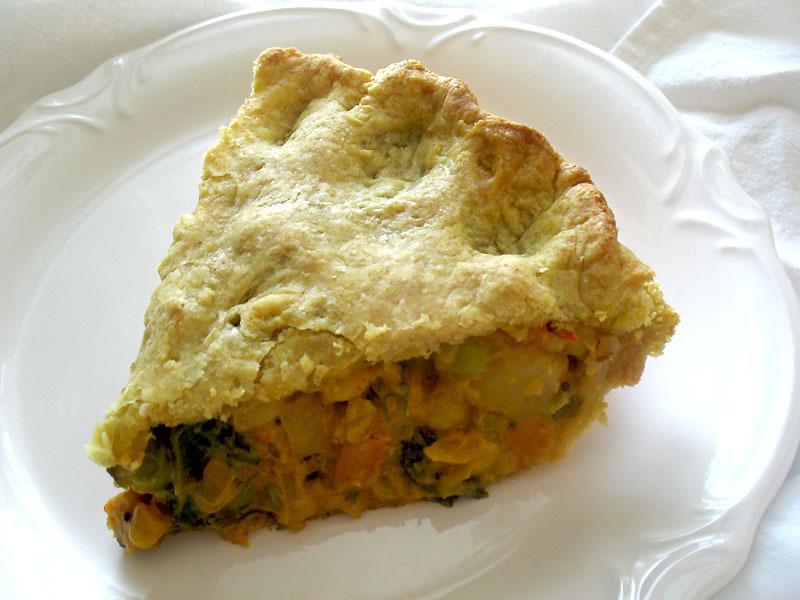 This pie is easily vegan if you opt for your favorite vegan crust rather than the butter crust I used for my pie. You may omit the chickpeas if you want a more traditional samosa filling. I had a craving and wanted to fill the dish out even further. This recipe was inspired by Bake and Destroy , a new release by Natalie Slater. Sassy in tone, and full of bold and inventive ideas, I recently received a copy of this book for possible review and it wasn't long before I had bookmarked many pages. The samosa potpie just had to be my first choice as I adore samosas and so do my dining companions. Ms. Slater's book is vegan and many of the recipes are inspired by her earliest cooking and baking experiences. 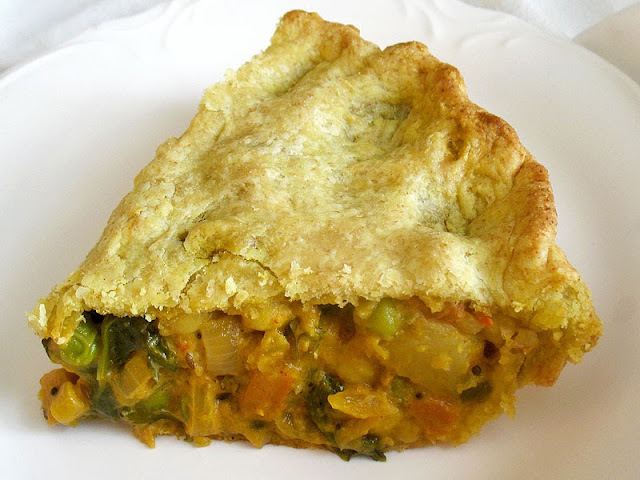 On the subject of pies, I am eager to try her Quinoa Potpie with some Mediterranean flair. Also bookmarked, Indian Buffet Pizza with Cilantro-Mint Chutney, Falafel Waffles, Crouching Cornbread with Hidden Broccoli, Chai Berry Muffins and Spaghetti Cake. My one complaint is the rather liberal use of soy products, margarine and shortening. There are workarounds though, for both vegans and vegetarians alike. The book is surely worth your attention if you want a refreshing vegan take on old classics and combinations that you may not have even considered before. It's no wonder, as Natalie is inspired by her experience cooking with her mom, her favorite music, restaurants and pro-wrestlers too. Sweets and Treats, Morning Munchies, Party Hard Entrées, Snacks and Sides and accompaniments are all on the menu. It's generously illustrated too. Note: I received a complimentary copy for possible review and was given the opportunity to host a giveaway. The opinions expressed here are my own. Begin by preparing your pie crust. If you are making the butter crust, combine the flour, salt and baking powder in a large bowl. Working quickly, cut in the butter using two knives or a pastry cutter until the butter is reduced to very small pieces. (Alternately, grate the butter into the mixture.) Gradually sprinkle 6 tablespoons of ice water over the dough and combine with a fork. The dough is ready for rolling once it holds together when you squeeze it. If the dough is too dry, add a little more ice water or some vodka. You don't want the dough to be too sticky. Divide the dough into two pieces and roll into balls. Wrap in plastic wrap. Chill in the refrigerator for 30 minutes. While the dough is chilling, prepare your filling. Heat the oil over medium heat in a large saucepan. When hot, toss in the mustard seeds and cumin seeds and cook, stirring frequently, until the mustard seeds turn grey and begin to splutter and pop. Add the onion to the pan and fry, stirring often, until the onion begins to soften, about 5 minutes. Add the carrot to the pan and cook for another 5 to 7 minutes. Now add the ginger, garlic and chilies, and cook for another few minutes. Next come the spices. Add the ground cumin, coriander, paprika, chili powder, chat masala (if using), turmeric, cayenne, asafetida and salt, and stir for 1 minute. Now add the tomato and continue to stir for a few minutes to thicken. Add the spinach, a handful at a time, until wilted. 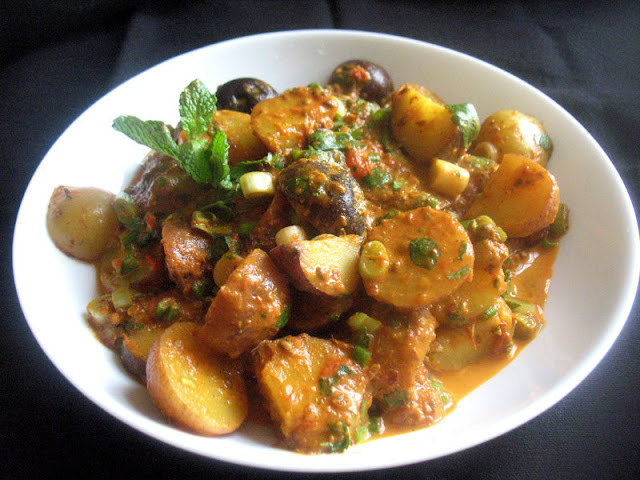 Gently stir in the potato, green peas, chickpeas, parsley and basil if using, and gently simmer on medium-low heat. In a small saucepan, melt the butter or heat the oil over medium-low heat. When hot, whisk in the flour and keep stirring until browned — about 3 minutes. Turn up the heat slightly and whisk in the coconut milk or yogurt. Simmer, whisking occasionally, until the mixture thickens — about 3 to 4 minutes. Whisk in the garam masala and transfer the mixture to the cooked vegetables and chickpeas. Simmer for another few minutes to blend the flavors. Remove from the heat and let cool for a bit. To finish, roll out half of the dough into a 12-inch circle, roughly 1/8-inch thick. Gently fold the pastry in half and transfer to a 9-inch pie plate. Do not stretch the dough, but carefully press the round into the dish so that the sides are lined and you have some overlap. Trim excess dough so that about 1/2-inch remains to make up the crust. Transfer the filling to the lined pie plate, spreading the mixture out evenly. Roll out the second round of dough and place on top of the pie. Press together the bottom and top layers of the pastry and trim off any excess. Fold the top layer of dough over and under the bottom layer, press firmly together and flute the edges. Cut 4 to 5 slits into the top of the pastry. Bake in a preheated 425° oven for 30 minutes. At this point, remove from the oven and cover the outer layers of the crust with some foil wrap so the edges don't burn. Return to the oven and bake for another 15 to 20 minutes or until the top of the pie is golden brown. Let the pie cool for 10 to 15 minutes before serving. If there is one pie I want to eat, this is it! I can see myself making this for my next potluck and wowing all my friends! Thank you. I like several vegan items, truth be told, I came to know about veganism after I came to the USA. And though I am not vegan, I make many things that are! One of them is 'Cheelas' or gramflour crepes. Filling an nutritious and vegan. This looks so good! Want! My favorite vegan meal right now is seasoned beans over savory quinoa with diced avocado on top. Yummy! That is such a great idea! Your pie looks really scrumptious. This looks amazing and will be happening in my kitchen soon that's SO much for posting this!! My favorite Vegan meal?! Yikes there are so many I guess at the moment what sounds best is Isa or Terry's(Veganomicon not sure who came up with this one) Baked potato and greens soup with potato wedge crouton but then it's cold and raining and the PERFECT weather for soup! 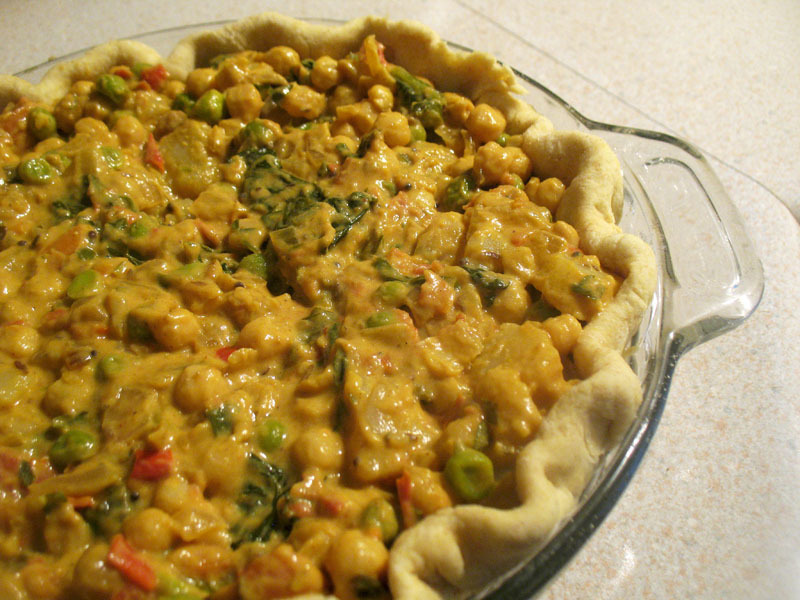 Lisa this samosa pot pie looks delicious I will try it for our weekend dinner. Yumm. Thanks for sending this delicious entry to MLLA #63 and also letting me host this wonderful event. This recipe looks amazing. I would make it without the chickpeas. 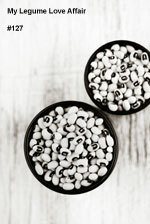 anything with brown rice or beans-change the spices and change the ethnicity. Your samosa stuffed potatoes are in our regular rotation. This looks delicious, and I love your inclusion of green and chickpeas for some well-rounded and delicious eating! I've never seen vodka in a crust recipe, though - do you know what purpose it serves? Hi Carol; Glad you enjoy the stuffed samosa potatoes. Regarding the vodka in the crust, I read a tip some time ago in a magazine. Use a few splashes of vodka if your dough doesn't seem moist enough to roll out. If you use too much water, you end up with more gluten formation, resulting in a tougher crust. On the other hand, vodka contains ethanol and because gluten does not form in the ethanol, you are more likely to achieve that perfect tender, rich and flaky butter crust that makes for the ultimate pastry experience. My favorite vegan dish will always be Mejadra! :) the combination of rice, lentils and onions is just divine and i can eat it every day! it is whole protein and if you make it with brown rice it is also very feeling. I love any variety of veggie + grain bowl. This afternoon I had a quinoa, avocado and kale bowl that was fabulous. Samosas on steroids indeed, and delicious too. I make one of your recipes at least once a week and each one has been delicious. 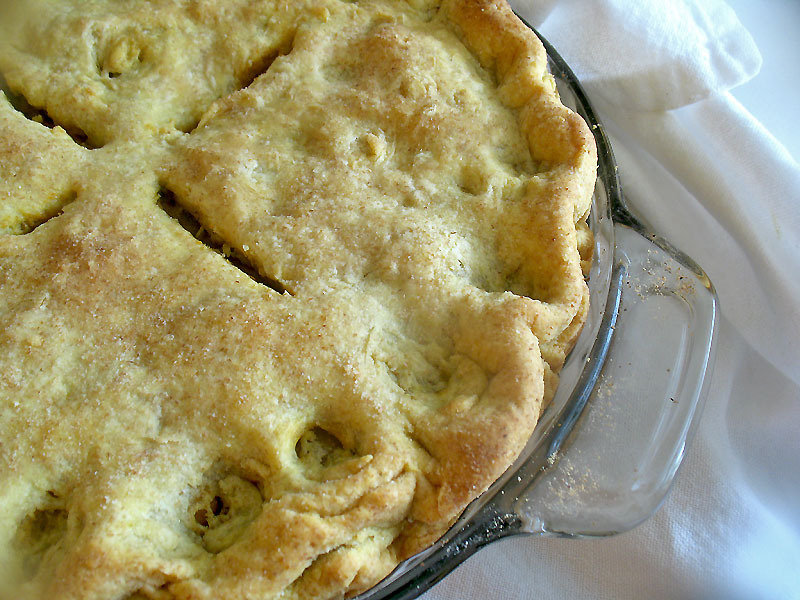 I make pie crust often and can't wait to try it with vodka. Thanks Michelle for your comment. I am delighted you enjoy my recipes. You must try the pie and let me know what you think. Heavenly. that looks so good. my favorite vegan meal is probably some fresh in season veggies sautéed and then add some grains and beans. not really a recipe but rather something to throw together with whatever is in season. This samosa pot pie is pure genius! It must be soooo delicious... Thank you for sharing the recipe! As for my favorite vegan meal, well, it's almost impossible to pick one, but I'll go with a current fave: a lebanese moussaka that's awesomely tasty, especially at this time of the year as we can easily find fresh, local organic eggplant and tomatoes. I love quinoa dishes, especially quinoa mushroom risotto. Oh this looks awesome and a bit daunting! But I think it's going to taste lovely in the coming winter months! As for favourite vegan mean, my all time favourite has to be vegetable biryani/mixed-veggies-pullao. Easy to make and delicious to taste. When I'm in a hurry, just putting together some potatoes, tomatoes and onions also makes an awesome dish. Wow! That pie looks so good. Right now I'm on a Puerto-rican frame of mind: beans (habichuelas guisadas) and rice, with fried sweet plantains. But I also love vegan enchiladas with refried beans and Arroz Verde. All my meals are vegan meals! One of my favorites is Teriyaki glazed tempeh with roasted vegetables. Thanks for a chance to win this great book! I made this pie yesterday and it is sooo good. Thank you for the recipe!! I made this for dinner tonight and once again...a perfect recipe! The crust is to die for and the mix of spices with the veg and beans is delicious! Next time I'm def doubling the recipe and freezing one pie. This pie took FOREVER (even after cheating with store-bought pie crust dough) to make but oh my gosh it was worth the effort! So delicious! I made this pie for a "Pie-Off" with some friends and won for best crust! Credit to you!!! Thanks so much it was DELICIOUS! 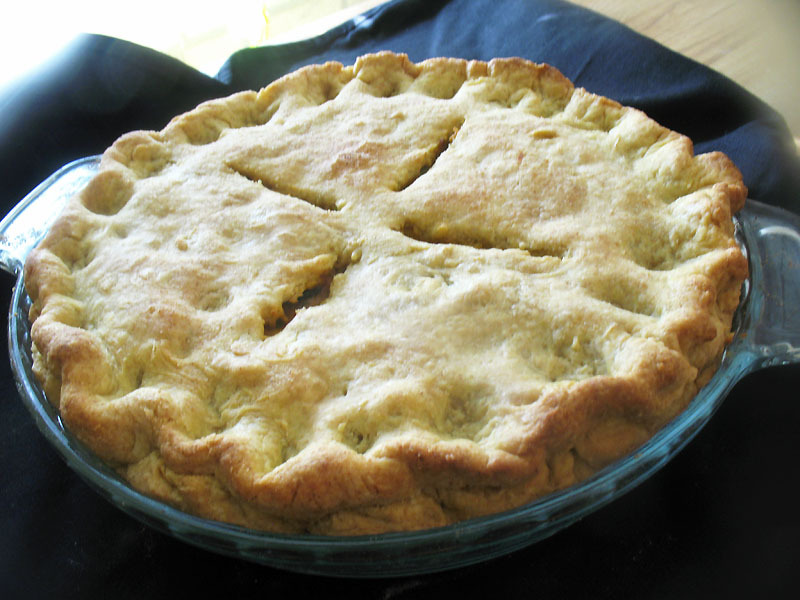 I made this pie for pie day. followed the instructions as is and it was the show stealer! Thanks for the great recipe! Lisa, tried the recipe with my own version of pie crust and came out very well. Made a couple of substitutions - used chopped Green pepper (capsicum) instead of spinach and coriander (cilantro) instead of parsley and basil. I made this last night and it turned out really tasty. I doubled the recipe to make two pies. With 2.5 cups of coconut milk, the filling turned out quite runny, so I added some cornstarch to thicken it up. The dough also turned out a bit thick, so I think the dough amount may be a little on the high side. Just make sure you look at the width when you roll it and try to keep it quite thin. We also had a little bit of extra dough and filling, which we used to make a few deep-fried samosas. Overall, excellent flavours and a fun recipe.